Candie Cooper is a jewelry designer with a passion for combining unique materials and color combinations, inspired by extensive travel and her years living in China. Candie is the author of Earringology, Necklace-ology, Metalworking 101 for Beaders, Felted Jewelry, and Designer Needle Felting. 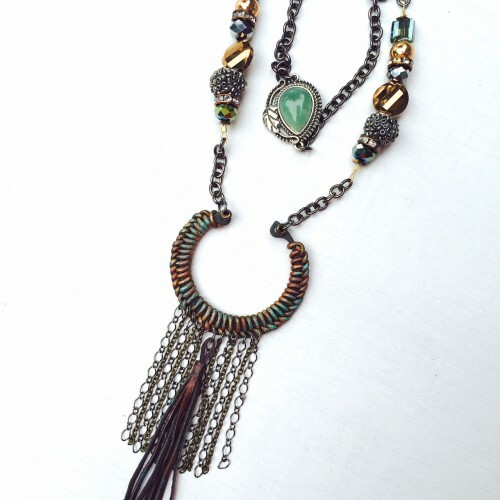 Candie hosts fun live videos that you can watch on Facebook (@candiecooperdesigns), creates custom designs for manufacturers in the DIY industry and teaches creative workshops including Beading with Wire, Chain & Leather on Craftsy. For a further peek into her creative life, visit CandieCooper.com/Blog or follow @candiecooper on all your favorite social media sites. Let’s take an inexpensive part from the hardware store and knot luxurious leather around it. Candie Cooper will show you the ins and outs of this simple technique that you can use over and over. You’ll also have the opportunity to paint and add texture to your leather tassel and focal pendant. The pendant is surrounded by beautiful Jesse James Beads and Beadalon findings. Leather from LeatherCord USA. Tools will be provided, but feel free to bring your own!